If you are a night owl, you can reduce eye strain by activating night mode on Twitter. It is available on the web, Android, and iOS. 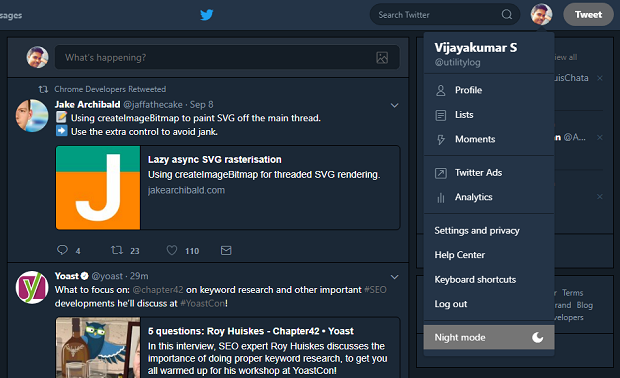 Whether you are a night owl browsing Twitter endlessly or you want to cut down the brightness and watch the true colors for a more pleasing experience, Twitter’s night mode is what you need. Night mode has now become a de facto standard for all services. It is similar to the Dark Theme on YouTube for the desktop version, but instead of a black theme, Twitter adds a dark blue theme. 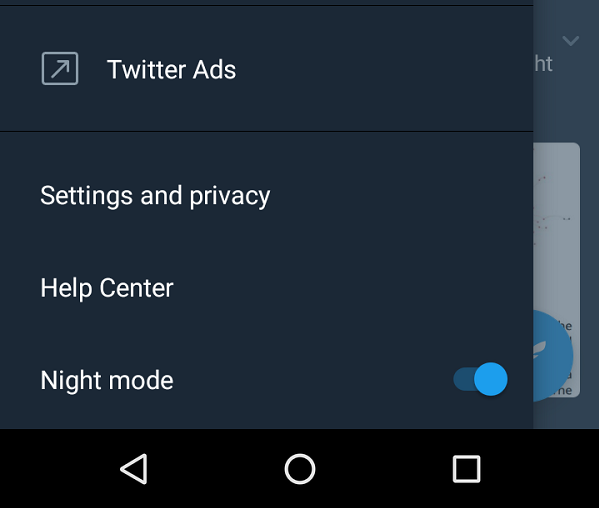 Twitter’s night mode has been there for long on Android and iOS versions, but it recently made its way to the desktop version. Though it has arrived late to the party, it is a welcome addition for desktop users like me. Click on your profile photo at the top-right. From the drop-down menu, click the Night mode. Click the Night mode option in the drop-down menu. Tap your profile photo at the top-left or swipe from left to open the menu. Scroll down to Night mode and toggle on. You can even schedule Night mode to turn on only during sunset and turn off during sunrise by going to Settings and privacy > Display and sound (under General) > Night mode (under Display) > Automatic at sunset. Tap your profile icon and toggle on Night mode. Tap your profile icon at the top-left. In the navigation bar that opens, tap the Night mode icon at the bottom-left. Tap your profile icon and then Night mode icon.